Forget Sudoku! 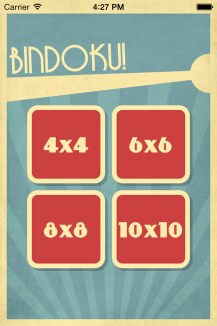 Bindoku is what you should be playing! It’s Sudoku without numbers, only blocks with two different colors. The perfect game to eradicate those short, but boring waits. You know the ones I’m talking about. 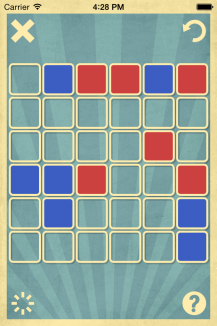 Select between different types of gameplay – warm up with a simple 4x4 grid and work your way up to mind-bogglingly brain-twisting 10x10 grids! Tap blocks to turn them red or blue. Sound easy enough? Wait until you hear the rules! 1. No three adjacent blocks may have the same color. 2. 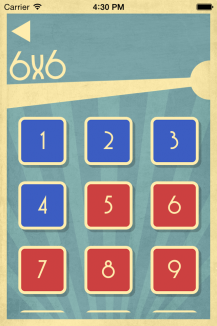 Every row and column must have an equal amount of red and blue blocks. 3. No two rows or columns may be identical to one another. Think you can solve the gazillion* grids we have on stock for you?